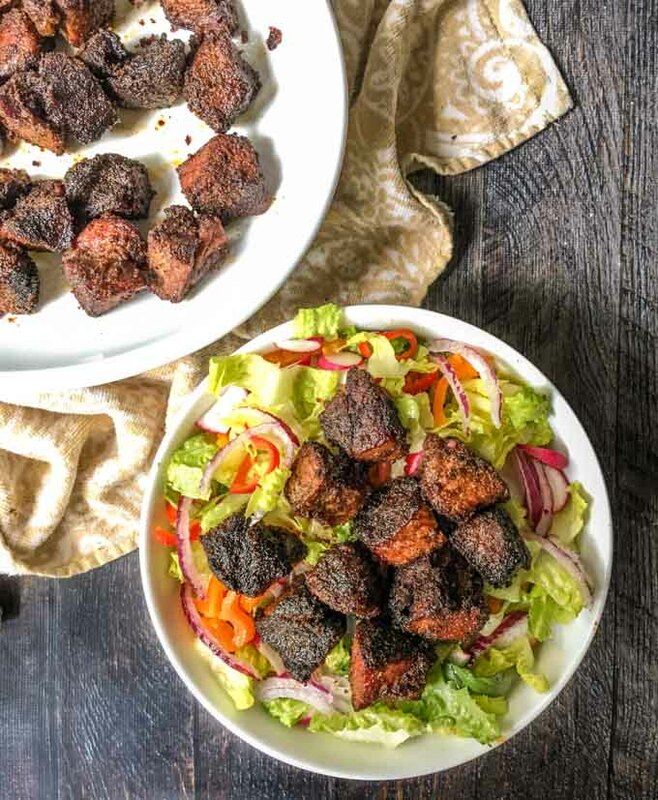 Low Carb Smoked Burnt Ends - Perfect for Dinner or as an Appetizer! 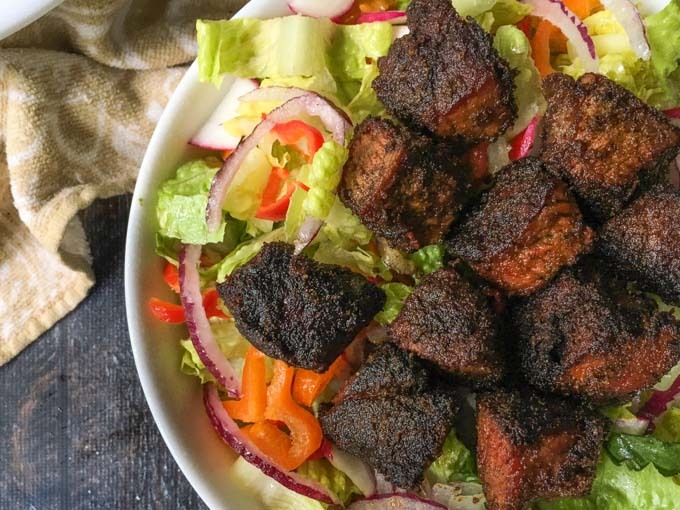 Low Carb Smoked Burnt Ends – Perfect for Dinner or as an Appetizer! 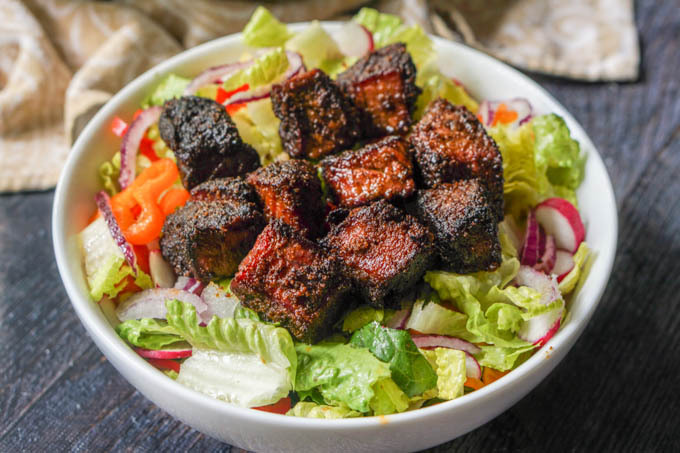 If you like crusty, morsels of smoked meat, you will love this low carb smoked burnt ends recipe. Each piece of meat has a spicy layer of rich flavor that will make your mouth water. A serving is just 2.5g net carbs. I have more smoked meat recipes for you to try: smoked brined turkey or smoked brisket recipe. They are great for making your own lunchmeat! Last summer my friend Lisa took me to this fabulous restaurant that served burnt brisket ends. I had never heard of those but I was in heaven. I love when meat gets that caramelized crusty layer of goodness. 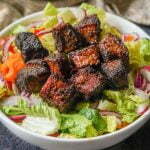 Since my hubby has become a amaster smoker, I decided to try to recreate it with this low carb smoked burnt ends recipe. We LOVED it! My husband was mad we only made one roast. Even as I type this I am craving it again. Can you make this smoked meat without a smoker? I have never tried this but I think you can achieve this if you cook the meat at a very low temperature (250 degrees F) for 4 to 5 hours. I would also use a bit of liquid smoke to get that smokey flavor. Or you can cook it in the oven and then throw it on the grill to get that smokey flavor. Here is an article to give you some ideas. Mix the spices and rub into a chuck roast. Get all the nooks and crannies but only use half of the rub. Smoke until the internal temperature is 165 degrees F.
Cut the roast up into 1 inch pieces of meat and mix in the the rest of the spices. Place on an aluminum pan and smoke for another hour or so. When I originally had this at the restaurant, it was a smoked brisket and they served on a salad with homemade potato like croutons. That was an awesome salad but the potato croutons were not low carb obviously. 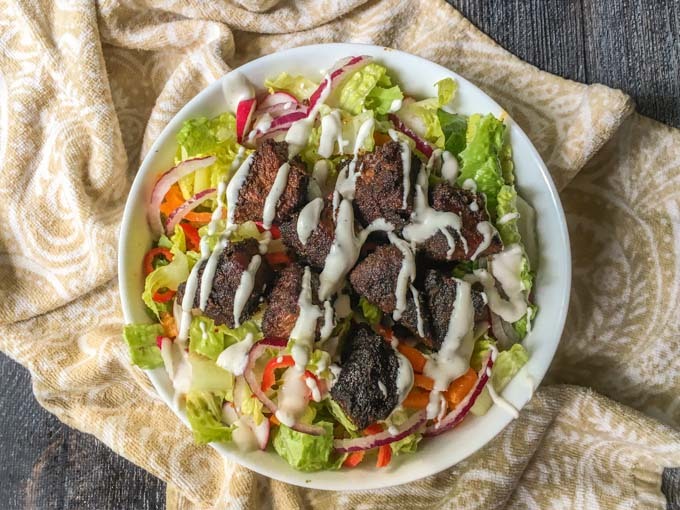 So I just ate this meat on top of a garden salad and topped it with some creamy dressing. Seriously good stuff here. My hubby and son just ate it as is. The bad part is that everyone picks at them while you are getting dinner on the table because they are so easy to grab and pop in your mouth. You can also serve these with a low carb bbq sauce if you like and maybe a coleslaw for dinner. These would make a great appetizer too I think. I’m going to have to try that for football season! *Note this is a very large serving. We just really liked it so we got 4 portions per 2.6lb roast. Make the spice mix but only use 1 tablespoon of the monk fruit. Mix it well and rub 1/2 of the mixture into the roast. Take the remaining monk fruit and spice mixture and mix together for later. Smoke the roast until the internal temperature is 165 degrees F.
Take out the roast and when it's cool enough to handle, cut into 1 inch pieces. Toss with the spices and place in an aluminum pan. Put back into the smoker and cook for another hour or so to get a nice caramelized crust on the meat. Previous Post: « Burnt Almond Torte Chia Pudding – an easy low carb twist on a classic cake!